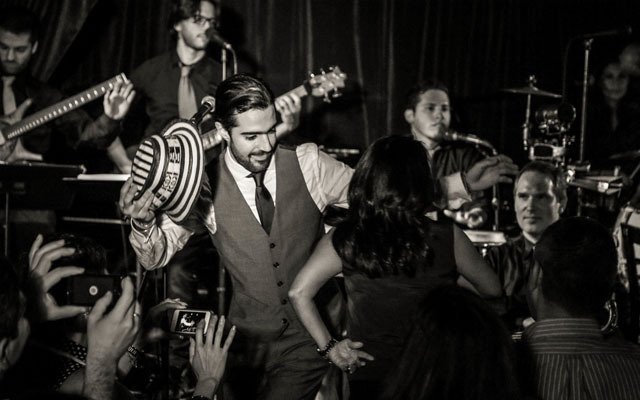 Listeners might never get over the emotion of listening to the Gregorio Uribe Big Band’s Cumbia Universal. It features some of the most spectacular writing by its young leader – an utter romantic and fully immersed in the Colombian tradition. It also features fine big band arrangements and no the least, superb instrumentalism from its members. But make no mistake about it. This is Gregorio Uribe’s vision about Colombian music infused with jazz-like improvisations by winds and brass, backed by the most exciting rhythmists including a young lady, Karina Colis on drums. A recording such as this happens once in a lifetime and even though I believe that Gregorio Uribe is one heck of a musician, he might be hard-pressed to repeat this success even though he will surely produce some beautiful albums in the near and far future of his career. The band exudes a glamour and exuberance known to few. I have returned to this recording several times since I received it only to be reminded that it has been created by one of music’s freest spirits, who also happens to be in the prime of his creativity. And it, as claimed, the fluent communication of emotion is the musician’s best asset it is here to be observed in its most outsize detail. 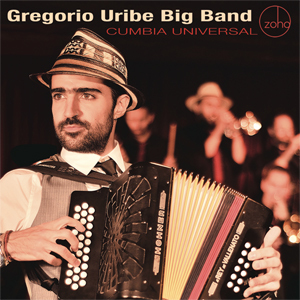 Gregorio Uribe is indeed a vocalist and accordion player with a larger-than-life personality and technique who has sent his audiences out into the night moved and awed by his distinctive eloquence and mastery. Every bar of every song on this rather short album is illuminated by his stylistic luxuriance and audacity (try the tumultuous rush and glitter of Cumbia Universal as well as the outrageously wonderful ‘Latin’ version of the Beatles’ Come Together) and when almost engulfed by his own virtuosity, he and his band’s performance is arguably the most wildly exciting on record. This is inspired music and it has been interpreted in the grand manner by a big band that appears to function like a well-oiled machine. 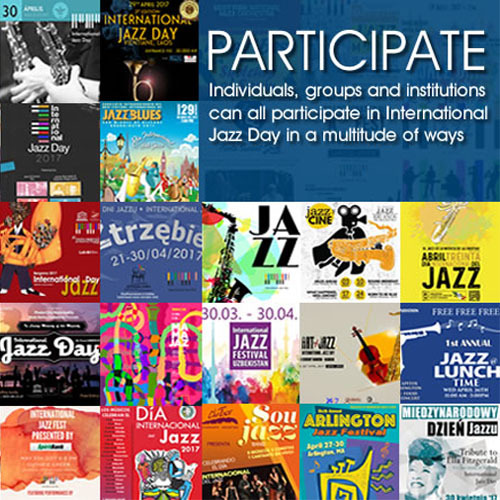 Ensemble playing is brazen and beautiful in unison passages and the soli are passionately imaginative with a special sense of quizzical charm and delightful oddity. Most of all, I cannot imagine this music played any other way. Such is its singularity. Expressive intensity never erases the quintessential Colombian essence and character. It is as if the famous early orchestras of Duke Ellington were reborn way south of the border. Gregorio Uribe’s extensive repertoire has been finely paired up with a band that was born to play it and realizing this, Mr. Uribe handpicked each and every musician not only by virtue of his or her proficiency but also because he was inspired to do so. This is one of the finest Latin jazz records I have heard this year, as racy as ever and including some of the finest musicians in and outside the studio. It simply bursts out of the gates as the baton drops and the fingers tackle the melodies with dizzying brilliance. It is music of an indelible and fantastic force. Track List: Yo Vengo; ¿Qué vamos a hacer con este amor? El Avispao’; Goza cada día; Cumbia universal; ¿Por qué se irá mi niño? ; Caribe contigo; Welcome to La Capital; Come Together; Ya comenzó la fiesta. Personnel: Gregorio Uribe: accordion, voice, guacharaca and maracas; Sam Hoyt lead trumpet; Jonathan Powell: trumpet and flugelhorn; Hugo Moreno: trumpet and flugelhorn; Mike Fahie: trombone; Matt McDonald: trombone; George Saenz: bass trombone; Sharel Cassity: alto saxophone; Linus Wyrsch: tenor saxophone and clarinet; Justin Flynn: tenor saxophone and clarinet; Alejandro Aviles: tenor saxophone and clarinet (6); Juan Fernando Ruiz: tenor saxophone and clarinet (6); Carl Maraghi: baritone saxophone; Paul Nedzela: baritone saxophone (6); Ignacio Hernández: guitars; Andrés Rotmistrovsky: electric bass; Jonathan Gómez: alegre drum, congas, caja vallenata, llamador and cymbals; Marcelo Woloski: tambora, bells, guacharaca and effects); Victor Cruz: alegre drum (6); Karina Colis: drum set; Mireya Ramos: background vocals; Solange Prat background vocals; Bryan Lazarus background vocals; Diego Obregón background vocals; Karina Colis background vocals (6); Andrés Rotmistrovsky background vocals (6) Victor Cruz (6); Mateo Salcedo: support and background vocals (1); Eduardo Vargas: support and background vocals (1) featuring Rubén Blades: voice (5).